Can Old Housing Bring New Answers? 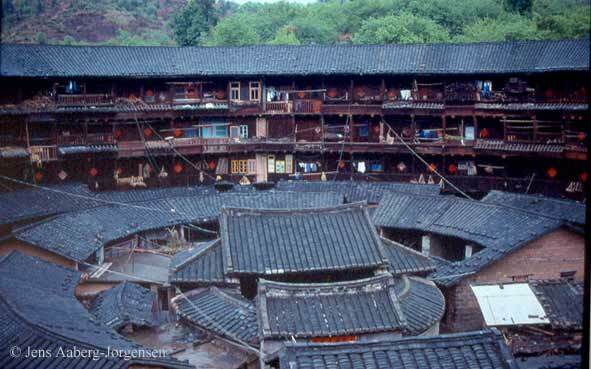 The Tulou are clan houses built in the Fujian province of South East China. It is believed that these structures were built as early as the 13th century, and many of them survive today at varying ages. Some are several hundred years old. I first heard of these structures from Earth Architecture’s website and they grabbed hold of my imagination for a few different reasons. First they are built from earthen materials, the outer walls being essentially rammed earth with wooden structures sometimes internally. I am fascinated with earthen building materials because you just can’t get more sustainable. Literally the whole world’s population could build their homes with dirt and the earth would be no worse for wear. Secondly, they have stood the test of time. Not only in the sense that the buildings have lasted for hundreds of years, but also people in China have continued to actively live in them and construct them up until the last 100 years. Practically, they must have worked. Not only did they succeed in providing defense from other warring clans, but there must have been more. Lastly, the tulou were built to house entire clans. Some of the ones still in use today house up to 600 people. Yet in Western culture it is rare to even find a handful of extended family members under the same roof. I myself live in an urban bungalow with my wife and child, but we have often sought ways to shake this formula up. International students have lived under our roof, friends who needed a place to go, and students who I have worked with and shared life with. But these arrangements have been temporary. Should we be so ardent about our values for individualism and personal space? Are these things the earned privilege of a wealthy and affluent culture? Or are they blights on what would otherwise be a more meaningful and sustainable life? What other residential models like the tulou are out there but withering in the brutal heat of modernity? Can we take some lessons from the dying clan lifestyle of China? Or at least build homes that we expect our children’s children to be able to come home to some day, if only for a visit. What is LEED, and will it work? The Leadership in Energy and Environmental Design (LEED) Green Building Rating System has been around now since 1998, and lots of people are talking about it. But just incase there are others out there like me (who talk alot about things they don’t know much about) I thought there could be some more to say about it here. The LEED rating system was developed by the U.S. Green Building Council, and it has several different standards: LEED for residential, commercial, for new structures, existing structures, commercial interiors, retail, schools, etc. LEED is a third-party certification program that can be applied for after completion of construction. Anyone can apply for LEED status on any structure, but if LEED certification is to be achieved there are two important types of qualifications. First, the structure must meet all of the prerequisites for certification. Second it must achieve enough total points throughout the catagories that LEED assesses. If any of the prerequisites are not met than the structure is disqualified right away. These can include things like ventilation systems to construction site pollution. If the structure meets all prerequisites then it must achieve a minimum number of points. For new commercial building (version 2.2) certification requires 26-32 points. Here is where LEEDs ranking system comes into play. LEED commercial silver status requires 33-38 points, gold status requires 39-51 points, while platinum requires 52-69 points. The rating system is finding acceptance worldwide, but will it work? The LEED system is developed by committees and these committees have agendas. Some of these agendas are being criticized. One such criticism is that LEED encourages too much use of fossil fuels. Another concern is that LEED’s requirements for older homes isn’t economical or affordable for the majority of Americans. Is it the sustainable path to encourage all Americans to remodel their seventy year old bungalows to qualify for LEED certification? These homes, build by the thousands all over America, have innately poor circulation, and this is an important prerequisite for certification. It certainly seems that the LEED system is here to stay. A positive for the rating system is that it should be able to flex and adapt affectively as more people become aware of it and participate in implementing it world-wide. Find out more at the U.S. Green Building Council’s page.